Lary, Diana. "Denise Chong". The Canadian Encyclopedia, 04 March 2015, Historica Canada. https://www.thecanadianencyclopedia.ca/en/article/denise-chong. Accessed 26 April 2019. After graduating from UBC, Chong moved to Ottawa for a career in the public service at the Department of Finance (1975-80). From there she moved to the Prime Minister's Office, as a special advisor on British Columbia issues. 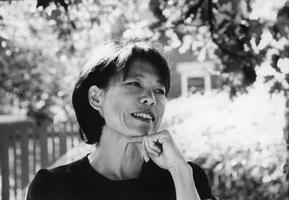 Political advisor and award-winning author Denise Chong (photo by Danielle Schaub). Denise Chong, writer, public servant, political advisor (b at Vancouver, BC 9 June 1953). Denise Chong, a third-generation Canadian of Chinese descent, grew up in Prince George. She earned a BA in Economics at the University of British Columbia (1975) and an MA in Economics and Public Policy at the University of Toronto (1978). Chong began her writing career as a journalist on the Ubyssey, the UBC student newspaper. Denise Chong is renowned as a writer and commentator on Canadian history and on the family. After graduating from UBC, Chong moved to Ottawa for a career in the public service at the Department of Finance (1975-80). From there she moved to the Prime Minister's Office, as a special advisor on British Columbia issues. In 1981 she became senior economic advisor in the PMO, and worked closely with Prime Minister Pierre Trudeau. Chong stood out in the white male world of Ottawa, as a brilliant young woman of Chinese origin; she was a trailblazer for the more inclusive public service that was to come. With the end of the Trudeau era (1984), Chong left the public service to become a professional writer. In 1985 she moved to Beijing with CTV correspondent Roger Smith, whom she married in 1989. A 1987 visit to her mother's ancestral village in Guangdong inspired Chong's best-known book, The Concubine's Children (1994). It is the story of her grandmother May Ying (the concubine) and her mother Hing, and their life in the Chinatowns of British Columbia. Much of that history had been hidden from Chong's own generation. The book also tells the story of the family members who were unable to leave China, and lived there through the Japanese occupation, civil war, the Communist takeover, land reform, and the Cultural Revolution. It is a story of courage, survival, struggle, and eventual triumph. The Concubine's Children won a number of awards, including the Edna Staebler Award for Creative Non-Fiction and the City of Vancouver Book Award. Translated into many languages, it touched a chord among readers far beyond the Chinese-Canadian world. The book celebrates the contributions immigrants have made to a country that may not have welcomed them warmly, but did allow them to make their way in life. Chong's work has stimulated other writers to embark on family histories, giving the stories of how their families settled in Canada. Denise Chong herself is a dedicated, though not a flag-waving, nationalist; her feelings are captured in her 1994 speech "Being Canadian," which has been widely anthologized. Denise Chong's second major book, The Girl in the Picture (2000), is the biography of Kim Phuc, a Vietnamese girl who was terribly burned in a napalm attack in 1972. The iconic photograph of the naked girl running down a road had a huge influence in the growth of the anti-Vietnam War movement in the US. Chong's book covers Kim Phuc's life from her childhood to her terrible injury, her slow recovery, and her eventual settlement in Canada. Both The Girl in the Picture and The Concubine's Children were shortlisted for the Governor General's Literary Award for nonfiction. Egg on Mao (2009) is the story of Lu Decheng, a young mechanic from Liuyang, China, who spent 16 years in prison for a defiant gesture - throwing paint-filled eggs at Chairman Mao's portrait above Tiannanmen during the 1989 pro-democracy protests in Tiananmen Square, Beijing. This gesture, intended as a rejection of China's political system, is the polarizing moment of Lu's life and Chong's book. The book examines, as Chong explains, the "human part of human rights," the ability to recognize what is good and decent and to demand respect and fairness. Although Egg on Mao tells the story of an ordinary man in China driven to do something extraordinary, Chong's book is ultimately the exploration of what it is to be human.